I hope everyone is having an amazing day. Are you ready to get started with week one? Once again if you have any questions, message me through the contact form on my website. I'll get with you as soon as I can. Go to the website here. Download the FREE PDF template files. Check out is required but no payment information will be taken from you. You'll be printing out two pages. Make sure to print at "Actual Size" just in case your printer changes the settings. To test to make sure the are the actual size, Take template "C" and from the dark back lines measure point to point and it should be 6 1/2" inches. 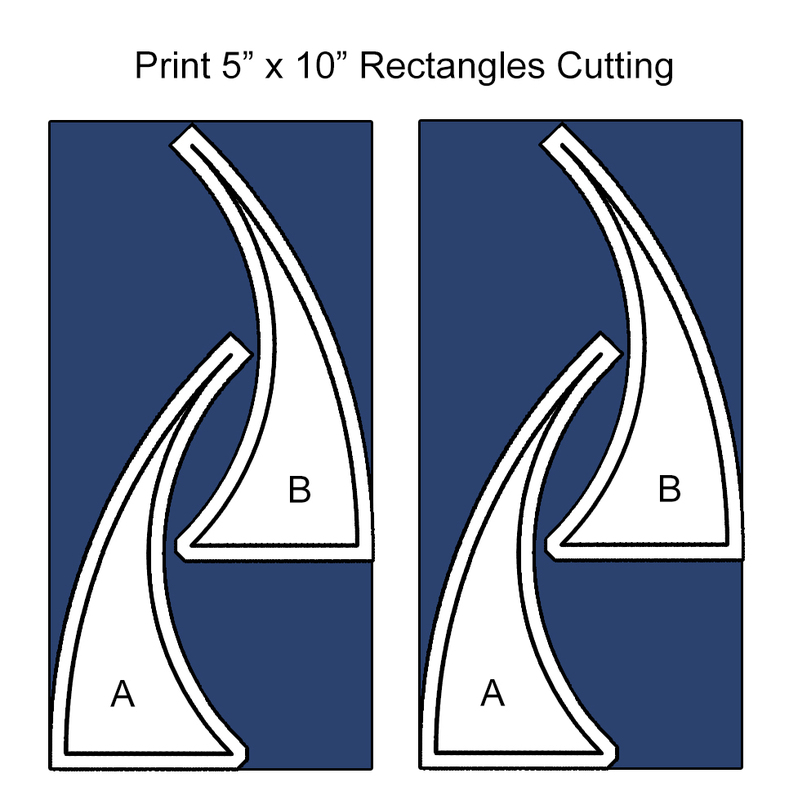 Using either the card board backing from your print layer cake or a 5" x 10" plastic template, place template "A" and "B" shown below. Use a pen, pencil, or marker to outline your templates. Once done use regular scissors to cut your templates out. Re-label templates. 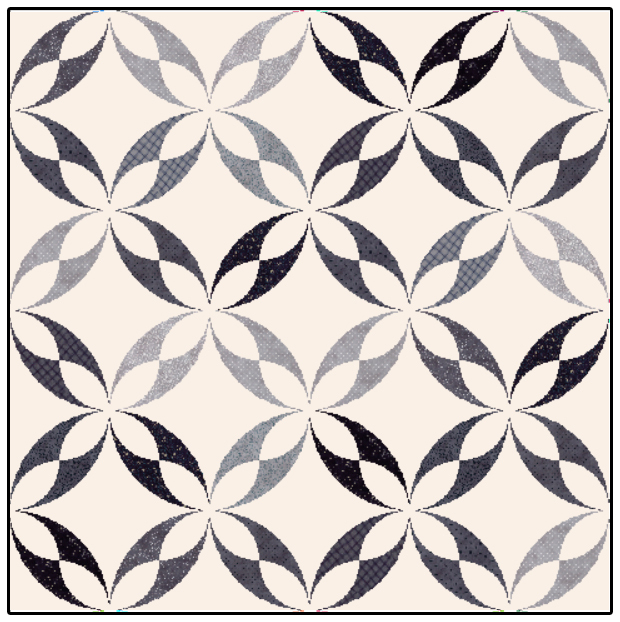 With 36 - 10" print squares, sub-cut them into 5" x 10" rectangles. Place template "A" and "B" shown below. Place template "A" all the way down to the bottom left corner. Before you cut the left side out, lay template "B" shown; but make sure you have enough room for template "B" to do so just in case. With your rotary cutter CAREFULLY cut along your template. Watch your fingers and I also recommend only cutting two layers at a time. Notes: Carefully watch your fingers and slowly move your rotary cutter. Using either a cardboard template or plastic template it is fairly easy for your rotary cutter to move on top of your template. If you are having troubles cutting the print fabrics, try using a smaller rotary cuter. Sometimes I like using a 28mm rotary. There you have it! First week, next Friday September 8th will start Week 2! Week 2 will feature how to cut your background pieces. Did a download as directed but it's not showing up in my downloads folder. Never saw it so can't search by name. This would be the templates.... What is the file called? How to download, add it to your cart and check out. Once checked out you will receive a confirmation email. Within that email next to the templates name will be a download click-able link. Click on that. You'll then be redirect to Lets Quilt Somethings website. Next to the right side there will be a green pdf file link. Click on that and then it will pop up in your downloads folder. Let me know if you are having any troubles. There it is - needed the confirmation link! Thanks!! Hello Krystal. You might want to remind everyone to print the templates at ACTUAL SIZE. The templates will distort enough to make for one very frustrated quilter if any other setting is used...such as "Scaling", or "Fit to Page", or "Shrink Oversize Pages", or "Custom Scale". I'm mentioning this because my computer automatically changed my setting to "Fit" and I've been that frustrated quilter in the past. Hello! Yes I received your message and made the changes. =) Thank You!